7TH GRADE B TEAM VOLLEYBALL WINS IN TWO!!! GETS THE SWEEP STARTED!!! 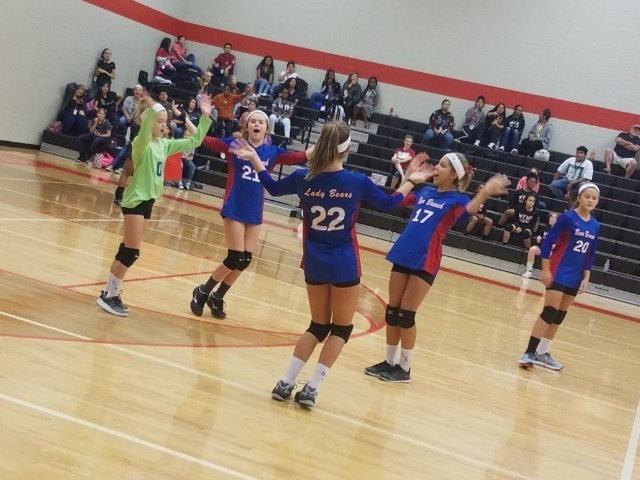 The Lady Bears 7th grade B (7B) had a sweeping win against Woodridge Forest Middle School. In game one, Madison Saldana served 13 straight points, including 8 aces. Kylie Murphy and Anna Sorensen also served aces. Kayla Hall played an incredible front row game. She hustled to every ball and made a difficult save that resulted in a point for the Lady Bears! 7B won their first game 25 to 6. 7B didn't let up in game two. Saldana scored another 9 points in a row from her serves. Hall and Michele Salas won 7B points with their aces. Carissa Thelen helped bring 7B to their 25 to 8 win with a great hit/kill from middle front. Seventh grade B is excited to carry their momentum into their tournament Saturday (9/29/2018) at York Junior High.